This month on Museum Archipelago, we’re taking you to Tasmania. For the next three episodes, we’re conducting a survey of museums on the island, and exploring how each of them relates to the wider landscape of museums. Subscribe to the podcast via Apple Podcasts, Google Podcasts, Overcast, or Spotify to never miss an episode. Below is a transcript of Museum Archipelago episode 61. Museum Archipelago is produced for the ear and the only the audio of the episode is canonical. For more information on the people and ideas in the episode, refer to the links above. This month on Museum Archipelago, we’re taking you to Tasmania. For the next three episodes, we’re conducting a survey of museums on the island, and exploring how each of them relates to the wider landscape of museums. Today, we begin with the Cascades Female Factory in the Tasmanian capital city of Hobart. It’s at the center of a shift in how Australians think of the role that convicts played in the colonization of the island. Jody Steele: The male convict story is the story that everyone’s heard about and everyone wants to discover something about it. So I think it’s odd that the female story is equally as fascinating and as intricate as the male story, and yet until recently nobody’s really shown that much of an interest in it with the exception of family researchers or people who have a specific connection. The site tells the story of European colonization of Van Diemen’s Land, the original European name for the island, from the female perspective. Jody Steele: The whole penal transportation to Australia and subsequently Van Diemen’s Land started as a result of prisons in England. Post industrial revolution, and people turning to crime without all the industries that they were used to, machines taking their jobs, the prisons just started to literally overflow. So they needed a mechanism to get the people out of those spaces, stop the overcrowding, and the colonization of Australia was an attempt to get that population out of Britain, and essentially far far away. Over 170,000 men women and children were transported during the transportation phase, which started in New South Wales in the late 1700s and in Van Diemen’s Land in 1803. 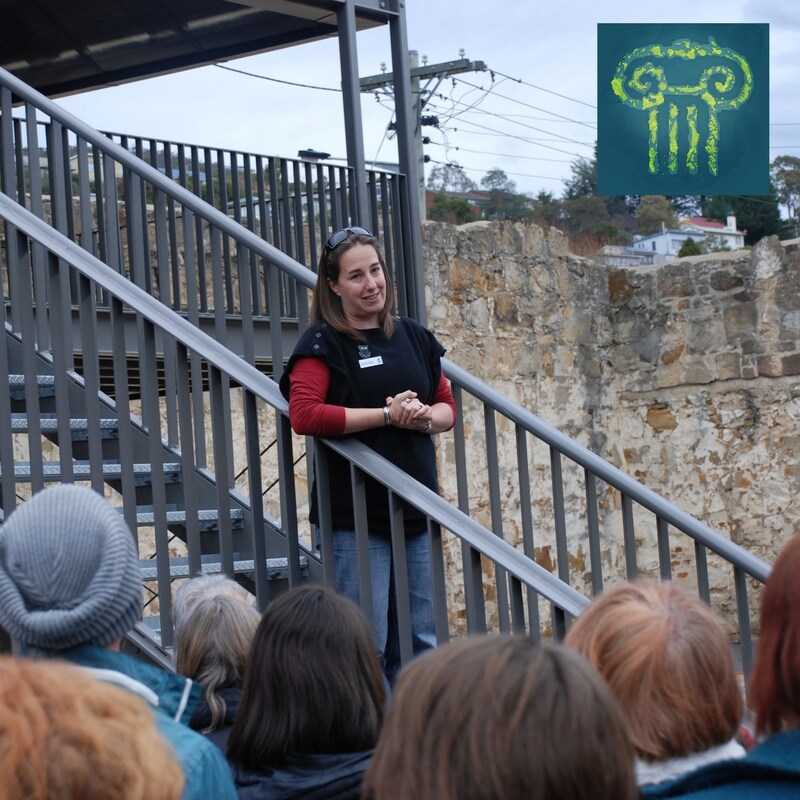 The only museum in Tasmania that represents the female convict story is the Cascades Female Factory, where Dr. Jody Steele works as the heritage interpretation manager. Jody Steele: Hi. My name is Jody Steele. I am the heritage interpretation manager for the Port Arthur Historic Site Management Authority, and we are lucky enough to be the portfolio managers of three world heritage sites with form part of the Austrian convict sites world heritage nomination. And the Female Factory fall under our portfolio. Understanding why the site is called the Female Factory means understanding how the female convicts were seen as resources to the early colonists. Jody Steele: Moving men out here as a labor force was something that seemed to make a lot of sense to the early Brits, to be able to pack up men and move them across the fall trees and to gather all the materials necessary for building, as in literally building a new colony. And then of course, if you want that population to grow, that can’t be done with men alone. So in the early 1800s, the first vessels with women on board came. Those women in the first days as convicts were usually assigned directly out to the early Hobart population. As your servants, housemaids, that sort of thing. As soon as anyone in that situation needed to be reprimanded for anything that they’ve done, they needed an establishment to do that. And so, as a result of that, the Cascades Female Factory was established. Jody Steele: Right here. So the female convicts were an amazing resource to that particular set of colonials. They could have female convicts coming in and care for their children. Witnesses educators and a lot of these women weren’t just petty criminals you know they were quite skilled at a number of trades. So you had two seamstresses and all of the trades that the men didn’t lend their hands to. You needed somebody to do laundry for the colony. And so having a prison filled with women who you wanted to put under hard labour to punish them. Laundry was one of the greatest ways to do that. You could well if the military presence could have their their uniforms laundered here and washed and ironed so it gave the colony a massive resource of trades that the men weren’t doing. Which is why it got its name as the Female Factory. The system operated under a strict series of punishments, that was nevertheless at the discretion of the guards. It was managed by a hierarchy of those incarcerated and was encouraged by attitudes towards what it meant to be a respectable women in the colonial society. Jody Steele: A lot of the women who were assigned out were assigned out to people. Some of them to people that they knew. Some of them even to their husbands which is quite curious and I think in those instances there is an absurdity to the system where these women were assigned to people that they were genuinely in love with. They wanted to have families with. They got pregnant. Pregnancy while you were under sentence was considered a crime which meant that those women ultimately would be removed from their assignment brought back here to have child they would spend time with the child when it was a baby. They would be usually weaned quite quickly from their mother. And sometimes you know within within months that mother would then be back under sentence being punished separated from her child with the child being left in the care of other convict women in the nursery usually by sort of three years of age. The child would then be removed from this location the nursery here and removed into an orphan school. You may never see your child again. Now as somebody who wanted to have that baby with the person they were with. That must have been horrific. And then there is the flip side to that story when you could be assigned out to an individual master. He may have had absolutely no choice in falling pregnant and yet you were the one who gets punished for that occurring. You would come back in here and quite often that into that individual who you were assigned to originally would simply just get a new female convict servant and you know you’re left under punishment for something that was clearly not your fault it must have been horrific. Steele says the biggest interpretation challenge is that is so easy for visitors to see the entire population of incarcerated people rather than individuals with vastly different, often contradictory, experiences. Jody Steele: I think the biggest challenge when interpreting a site like this is people come with an understanding of a mass population. They think of a convict population. And unless they happen to be descended from an individual convict, they find it really hard to think about the individual within the system. And with over 7,000 women passing through these few yards alone, it tends to be the mass mentally that we try to break down here, which from my perspective is the most fun part of what I get to do, is to find the odd individual who has this amazing story, whether it be a tragic tale or a tale of resilience and strength. Telling the stories of odd individuals is complicated by the fact that not many artifacts remain. The site itself is made up of three yards, surrounded by sandstone walls with only markings on the ground indicating the size of prison cells or nurseries. Jody Steele: The challenge here, unlike a lot of our convict site museums is that the artifactual material associated with female convicts just isn’t there. Even our state museums, don’t have a lot of artifacts associated with female convicts. There isn’t the material history surrounding them that has been maintained for them men. Jody Steele: Probably one of the hardest things to deal with is the fact that most of the convict population didn’t have access to the time or the inclination to sit down and write a daily journal, and for most of them the literacy wasn’t particularly high usually when they arrived, but part of the convict system was actually educating a lot of these people, so a lot of them left with a much better education when they got in, but the time they could have started writing a journal, they were most likely off getting married, building businesses. So there’s a massive gap, and we really do rely heavily on what is the administrator’s view of these individuals, right down to the way they described them when they got off the ships. And then, we rely heavily on their descendants, who have all those stories and the oral histories of how these families built up from these individual women. Dr. Steele talks about a massive cultural shift in Australian attitudes towards ancestors who may have been incarcerated. Because the family memory of the Female Factory goes back just two or three generations, it’s an opportunity for the museum to better interpret and educate by becoming a hub for these stories. Jody Steele: For a very long time, having a convict ancestor was considered something to be ashamed of. And that has probably only shifted in the past 20 years of having a sense of pride of being descended from a convict when they became aware that even through they may have been criminals, some of them quite serious, some of them petty, that they were responsible for building the new colony of Australia. And that’s been a real shift of people being real proud of it now, and because genealogical research is now enormous, we’ve got access to things that aren’t that oppressive record. Business records, and images of shopfronts where these people built businesses. Massive massive change in attitude. The Female Factory is in the middle of a design process to open a brand new History and Interpretation Centre on the site. The process began with an architectural design competition judged by an all-female panel. Jody Steele: It’s really important when we’re working on this site that we recognise the contribution of women to society. I mean that is that is why this place is is recognised and part of that process when we we put the call out for the architectural design competition was that we really wanted women to contribute to this project we had over 50 original people who came in who put their hand up to get involved in the competition and we pulled together a team of amazing women mostly architects and the chair of our board Sharon Sullivan who oversaw the process and did all of the review of all of the nominations. Looking for things like female contribution of course looking at the Heritage impacts and how the building would would sit in in the landscape and what stories the building itself might tell the new building that they were hoping to put in this space will be clearly identifiable as a brand spanking new building that is that is part of our intention but it will also hopefully be aside from being a beautiful architectural structure. We’re hoping that it will recede and then the individual stories will come out as you’re inside the building. The building will be located over the cellblock location so I guess you know in a lineal form it will represent part of the historic landscape. But outside of that most of our storytelling will have to be in a very different format and we’ll have to get really creative. We work really closely with a group of people called that are called the female convict Research Center that’s started as as a bunch of women female researchers who I think they would forgive me for saying they’re totally obsessed with female convict history and they have built up a an amazing database of all of the female convict women. And so we have access to that database and it would I mean what an amazing thing to be able to know that you have a female convict ancestor to be able to come here to tap into that find out how long they were here exactly what space they were living in working in even being punished in to be able to go to that space you know and stand essentially in the footprints of your ancestor would be an amazing thing. You can see the winning design in the show notes for the episode. The architects call for a beautiful but solum building with plenty of play between the open spaces of the yards as they are today, and confined spaces of cells as they used to exist. Hobart is a city partially built with convict labor, but the reminders — the type of stone on a building for example — are subtle, and you have to know what you’re looking for. A structure like the one proposed removes the sublty, and makes it harder to forget. Jody Steele: I would I would love you know the female convict history to be the first thing that people engage with and then to flow on into into the story of the men. I want people to walk away even if they don’t have a better understanding of convict female convict history. I want them to walk away asking questions and I think that’s what we all want when we build these places we want them to start questioning what they believe what they think what they knew before they walked in the door. I don’t necessarily I mean subliminally I’d love to educate everyone who walks through the door but quite often those people are on holidays and they probably don’t want me lecturing to them for an hour and a half about convict history. But I want them to walk away questioning you know what this place meant to Tasmania or you know what the women at least felt or went through to try and get some kind of gut reaction from them and to that experience that these people went through to create the place that we live in working today. Do you like the podcasts I make? Club Archipelago is the best way to support me. It gives you access to a special bonus podcast that’s an even deeper dive into the museum landscape — kind of like the director’s commentary to the main show. There are longer versions of some of my interviews, commentary on the industry as a whole, and insider tours of various museums from past guests, all with the same humor and quality you’ve come to expect from Museum Archipelago. 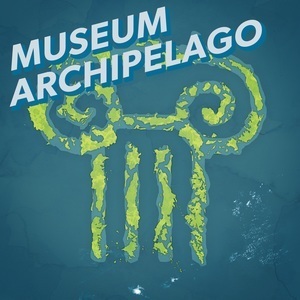 Join today for as little as $2 at Pateron.com/museumarchipelago, and get Museum Archipelago Logo stickers mailed straight to your door. That’s pateron.com/museumarchiepalgo. Jody Steele: I can admit, I like you am a total museum junke and wherever I go I drag anyone who I’m traveling with to every possible museum to every possible museum in every possible place to wherever I travel around the globe. I’m the person who reads the sign and then taps on it to figure out what it is made out of, and whether I like the font. You’re there, you’re there with me, you do it in every museum you walk into.